Pretty soon wedding season will be in full force and DIY disasters will be among us. Skip the hot glue gun and opt for personalized wedding favors instead. You will find that our budget friendly options will not only save you precious wedding planning time, but will also be a major hit with your guests. From near and dear to the heart to funny and useful items, these 10 Budget-Friendly Personalized Wedding Favors will be the perfect finishing touch to the day you’ll never forget. Wedding favors are the best! They’re a great way to say “thank-you” to your guests for their role in your life and wedding. Pass on the flimsy paper bags that get tossed and treat your guests with Personalized Gift Bags. With over 100 customizable size, shapes, and colors these personalized gift bags are truly one of a kind and like your marriage, these sturdy bags are built to last a lifetime. Have your guests cheering to you long after the bottles popped! Personalized wine glasses are timeless and romantic. Gift your guests stemless, flutes, and even decanters to enjoy their favorite beverage in honor of their favorite couple. Not everyone’s a wine drinker, but most love a cold one. Personalized Beer Glasses are a fun a creative personalized wedding favor for the couple who stays true to their malty roots. You can select from a pilsner glass, novelty glass, Steins & Tankers and more. These personalized beer glasses are suitable whether you prefer an IPA or a Dark Ale. With the wedding mostly being about the bride, beer glasses can also serve as a friendly reminder that the groom and groomsmen are just as important…well, almost. Everyone might not drink wine or beer, but they ALL drink tea or coffee! Whichever beverage they hope to keep warm, these Personalized Coffee mugs are the perfect gift that we consider to be universal. Mugs always tell a story of a place or time. Let them tell or your special day. 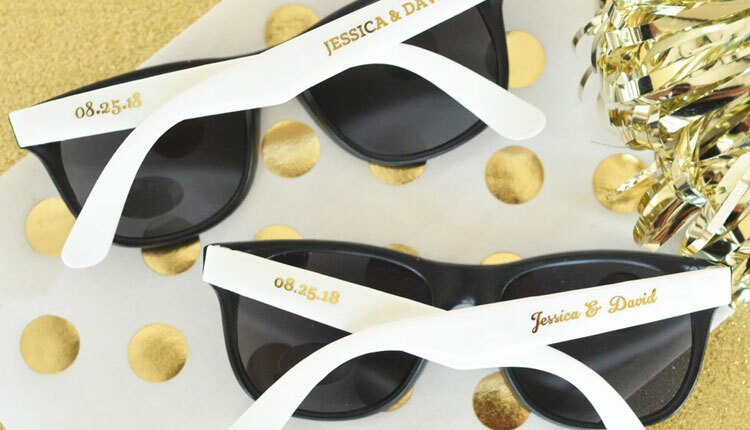 Destination wedding or not, these Personalized Malibu Sunglasses are the perfect wedding favor for both guys and gals. Sunglasses are an essential accessory. If your ceremony is being held outside, leave this stylish personalized wedding favor on each chair. No one will have the sun to blame if they miss your first kiss as a married couple. Selfie Sticks are the most underrated personalized wedding favor. They’re not only hilarious but extremely useful on your wedding day! Encourage guests to use their personalized selfie sticks at the reception and to tag you in their shots. You’ll be in for the most epic photobombs as these selfie sticks allow for wide-panoramic angles. Your guests will be able to capture the entire party in one click. Your Bridesmaids will adore you for this one. Personalized Spa Kits are a luxurious yet affordable way to treat the ladies who’ve been there since day one. Choose from a small foot care kit, eye masks, or 4-7 piece spa kits. These personalized wedding favors are guaranteed to relax your besties. Another timeless wedding favor are Personalized Executive Pens. With a nice weighty feel these metal pens feel high-end while actually being very budget friendly. Add a touch of sophistication to your favor bag with these unforgettable pens. Weddings rarely start on time. Keep your guests busy with their own personalized gadgets and toys including Fidget Spinners, Frisbees, Hacky-Sack and more. These personalized wedding favors will make for the least boring wedding ever! Your tech savvy guests will love their one-of-a-kind Custom Shaped Flash Drive. An iPromo bestseller. The process and result of this unique and personalized wedding favor starts with a custom design of your choosing or creation. Go for something light and fun or heartfelt and meaningful, either way this gadget will always be put to good use. Skip the age-old candles and get your friends and family something they’ll like (and actually use) that has a stylized reminder of your special day.